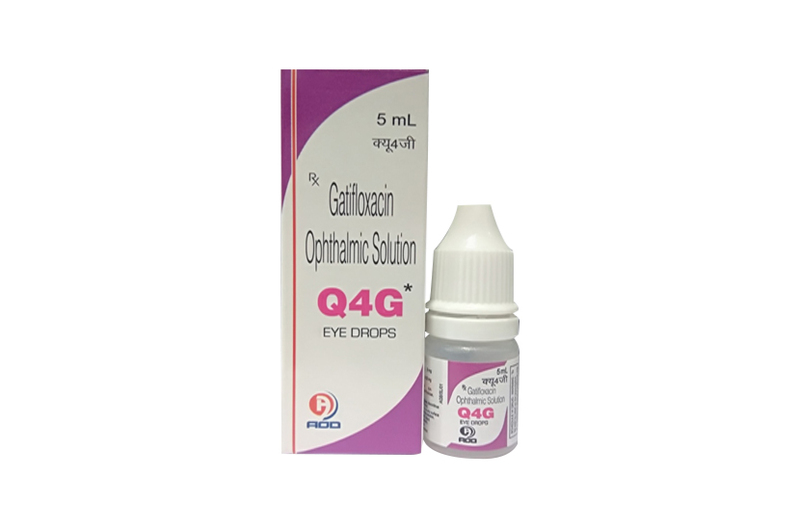 Q4G-Eye Drops (Gatifloxacin Ophthalmic Solution) is used to treat infections of the eye, such as bacterial conjunctivitis. Gatifloxacin belongs to a group of medicines called fluoroquinolone antibiotics. It works by killing bacteria that cause conjunctivitis. Gatifloxacin is an 8-methoxyfluoroquinolone with a 3-methylpiperazinyl substituent at C7. The antibacterial action of gatifloxacin results from inhibition of DNA gyrase and topoisomerase IV. DNA gyrase is an essential enzyme that is involved in the replication, transcription and repair of bacterial DNA. Topoisomerase IV is an enzyme known to play a key role in the partitioning of the chromosomal DNA during bacterial cell division. The mechanism of action of fluoroquinolones including gatifloxacin is different from that of aminoglycoside, macrolide, and tetracycline antibiotics. Therefore, gatifloxacin may be active against pathogens that are resistant to these antibiotics and these antibiotics may be active against pathogens that are resistant to gatifloxacin. There is no cross-resistance between gatifloxacin and the aforementioned classes of antibiotics. Cross-resistance has been observed between systemic gatifloxacin and some other fluoroquinolones. Resistance to gatifloxacin in vitro develops via multiple-step mutations. Resistance to gatifloxacin in vitrooccurs at a general frequency of between 1 x 10-7 to 10-10. Gatifloxacin has been shown to be active against most strains of the organisms both in vitro and clinically, in conjunctival infections. Gatifloxacin ophthalmic solution 0.3% or 0.5% was administered to one eye of 6 healthy male subjects each in an escalated dosing regimen starting with a single 2-drop dose, then 2 drops 4 times daily for 7 days and finally 2 drops 8 times daily for 3 days. At all time points, serum gatifloxacin levels were below the lower limit of quantification (5 ng/mL) in all subjects. Q4G-Eye Drops is contraindicated in patients with a history of hypersensitivity to gatifloxacin, to other quinolones, or to any of the components in this medication. Q4G-Eye Drops is supplied in one Clear Polethylene Bottle packed with printed labelled & cartons And Such 25 carton packed in a shrink Sleeves & corrugated box.